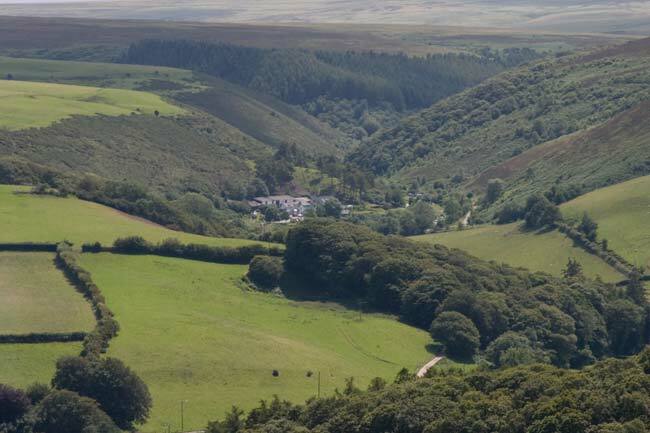 Moving into the heart of Exmoor we come to the Doone Valley setting of R. D. Blackmore's classic novel Lorna Doone. 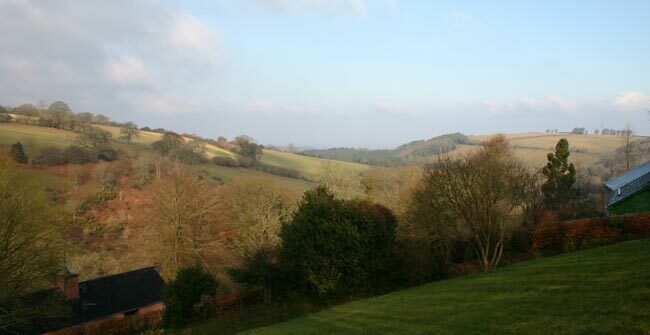 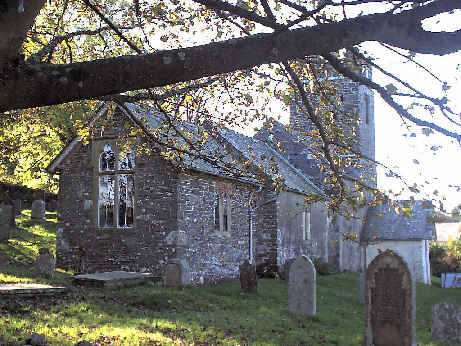 It is a hidden valley with beautiful scenery, the first two views are of Lorna Doone farm and of Oare Church. 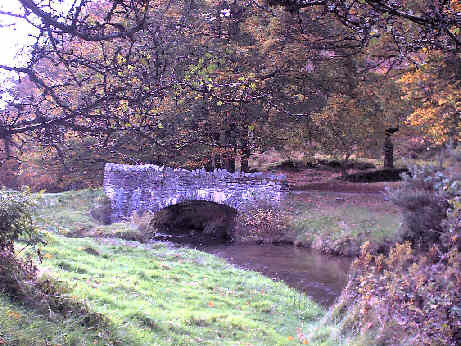 At the eastern end of the valley is Robber's Bridge, seen set off by autumn colours. 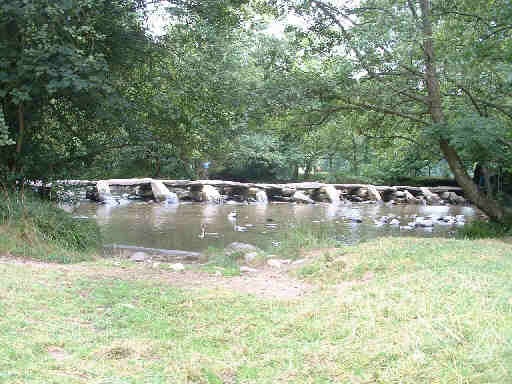 A spring view of Robber's Bridge from the opposite side. 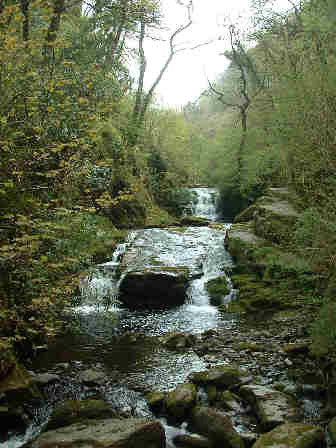 Another view of the stream at Robber's Bridge taken slightly upstream of the bridge itself. 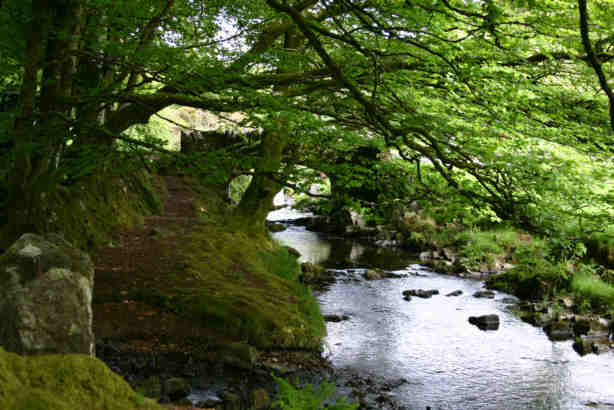 There is a camp site in the Doone Valley beside Badgeworthy Water, these photos are of the river there. 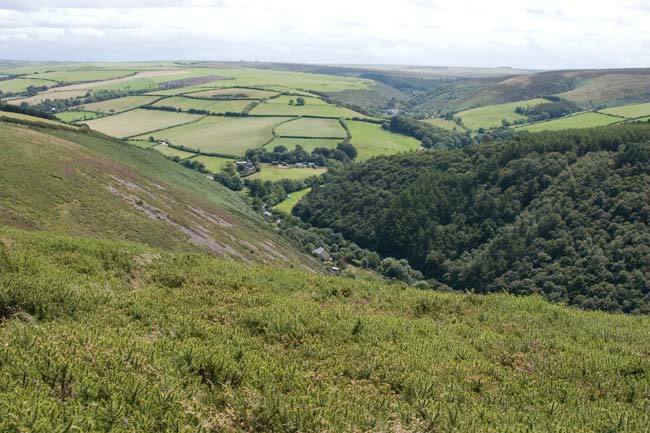 County Gate marks the border between Devon and Somerset and has views down into the East Lyn valley and to the Doone Valley as seen here. 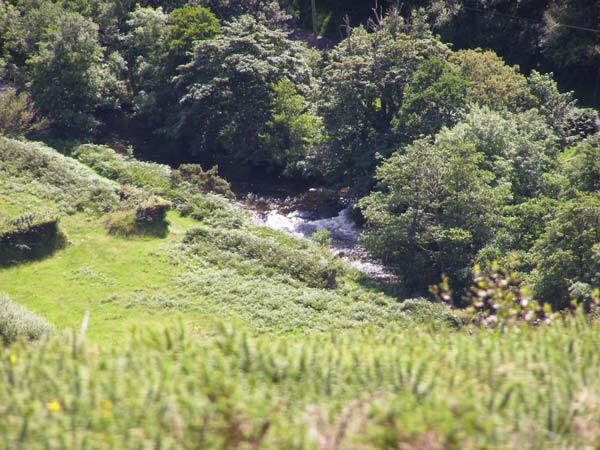 Zooming in on the Doone Valley. 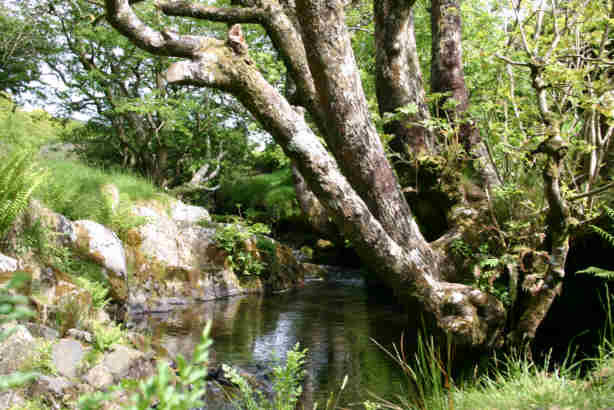 Hidden in the trees to the left Badgeworthy Water and Oare Water join together to become the East Lyn River. 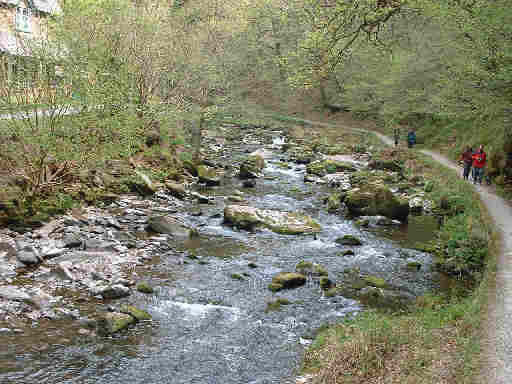 Looking down to the East Lyn which was running fast following a very wet spell. 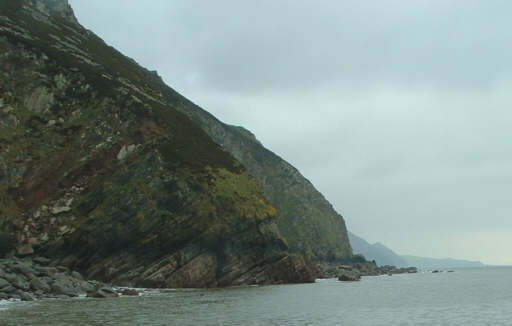 Turning west, the East Lyn follows its valley towards the sea at Lynmouth. 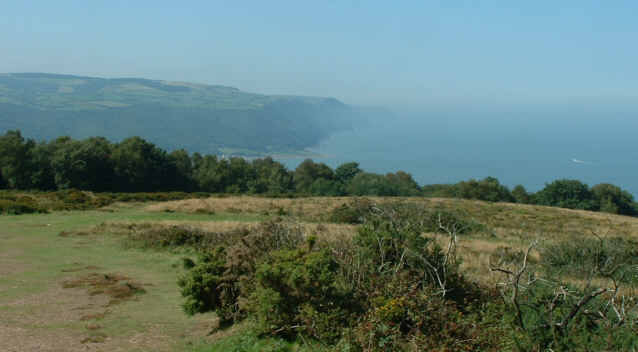 The next part of the moor is Lynton and Lynmouth, starting at Lynmouth with these views. 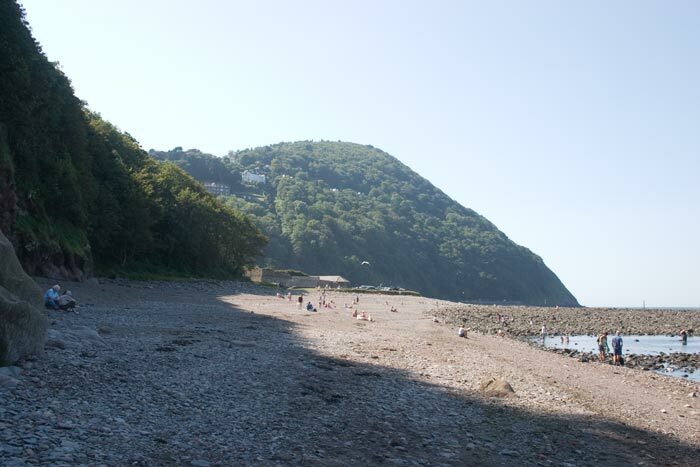 A view from Lynmouth beach looking west towards Foreland. 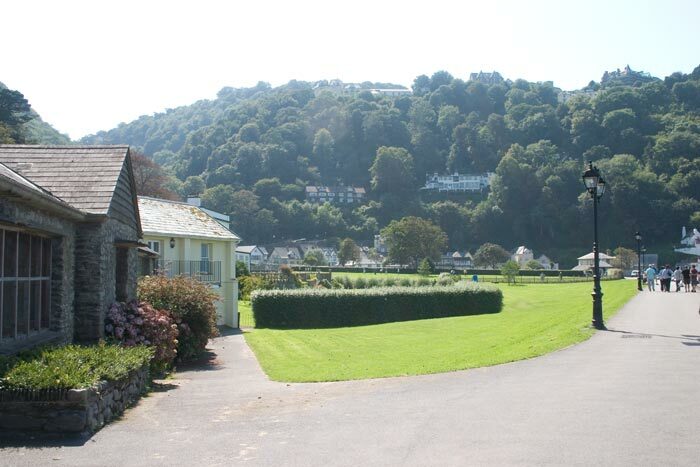 Looking the other way back towards Lynmouth and, on top of the hill, Lynton. 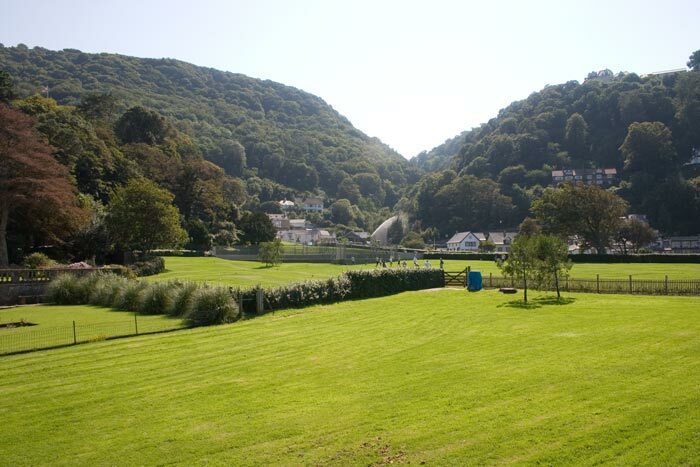 Taken from a bit nearer, another view of the twin towns and the wooded hillside between them. 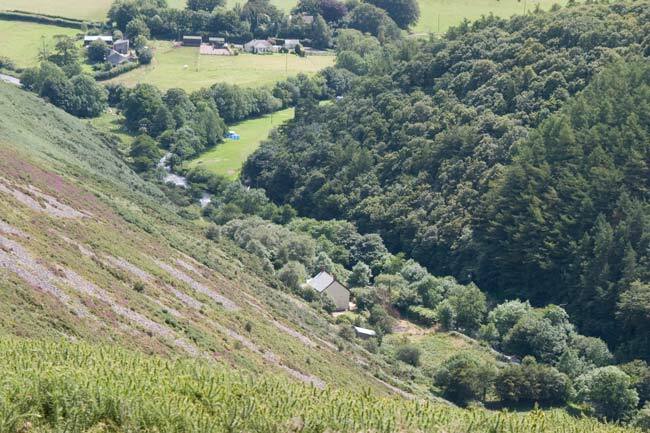 A bit nearer again, looking towards the West Lyn Valley. 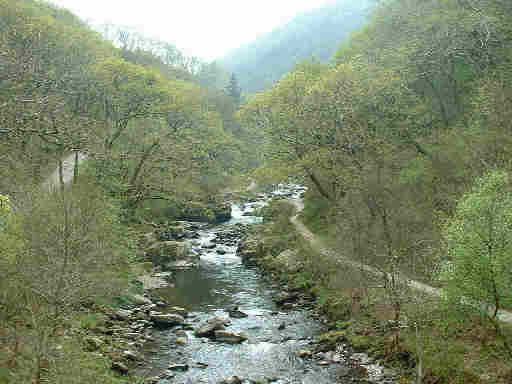 Down by the Lyn, off towards the left is the East Lyn with the West Lyn coming in from the right under the bridge. 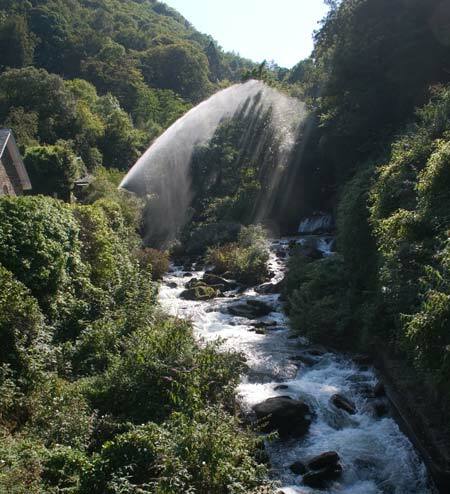 Glen Lyn Gorge, seen from the road bridge, includes an exhibition "Power Of Water" hence the column of spray. 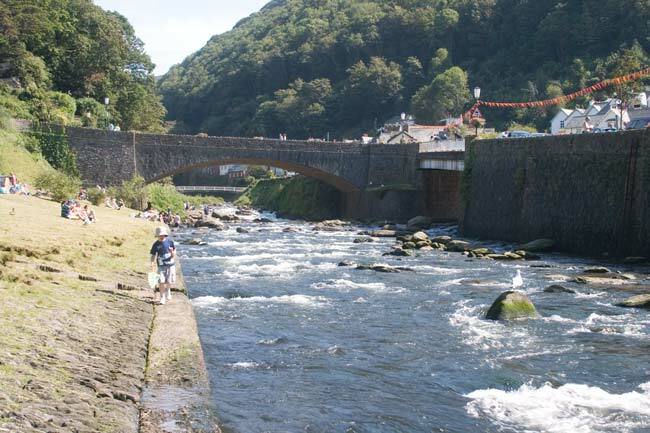 Looking down the East Lyn River towards Lynmouth from a footbridge. 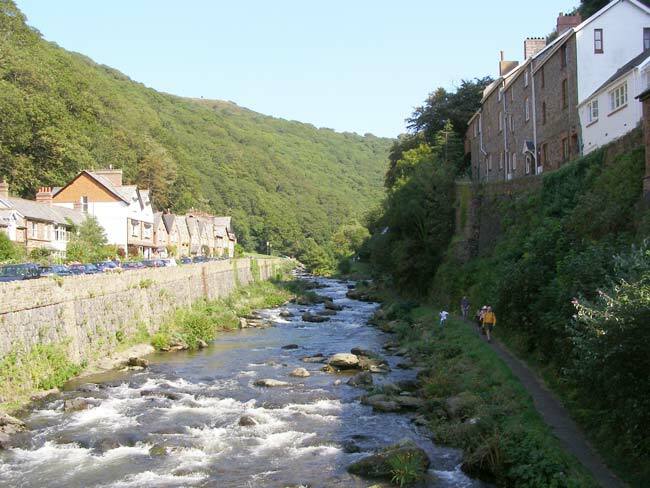 Looking the other way from the same bridge, the houses peter out and the woods come right down to the river. 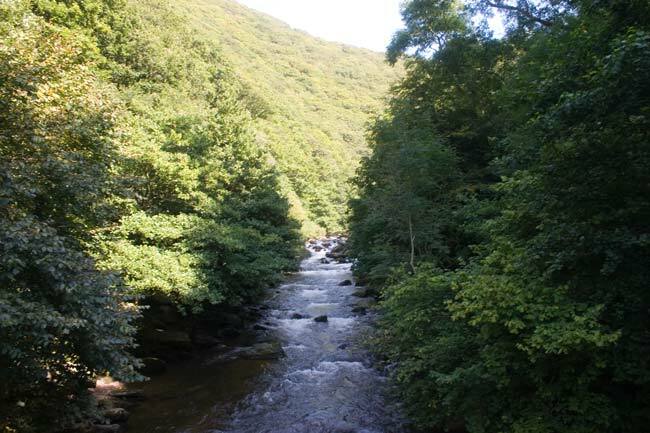 Another view a bit further up, there are more photos of the East Lyn below at Watersmeet, it is also the river that drains the Doone Valley, more photos above. 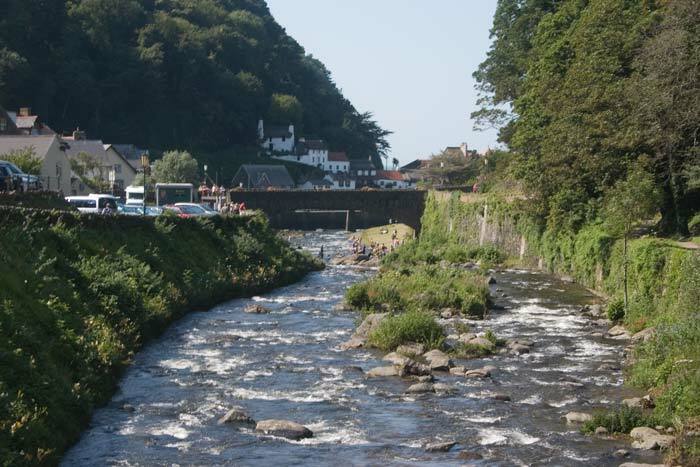 Lynmouth was the scene of terrible flood disaster in August 1952 when sudden heavy rainfall over the moor led to a raging torrent which ripped the heart out of the village causing many deaths. 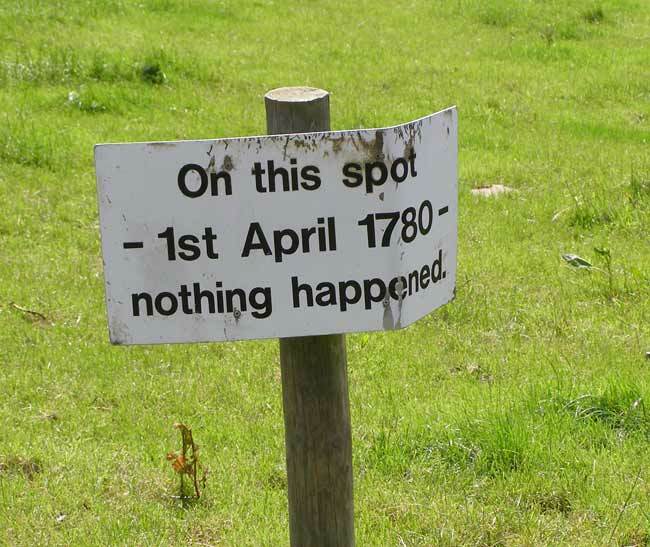 Today you wouldn't credit that such an event could ever have happened, it's a very attractive little place astride the River Lyn. 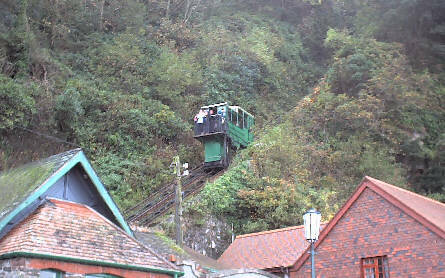 It is linked to it's neighbour, Lynton, by a funicular railway, powered by using the weight of water in the descending car to pull the other one up. 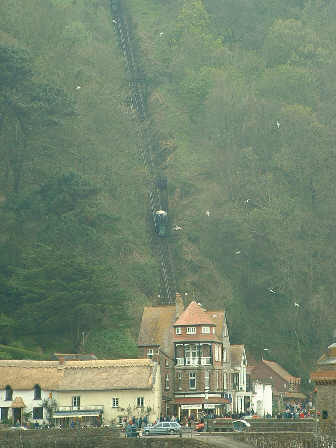 In these two photos the line can be seen going straight up the cliff. 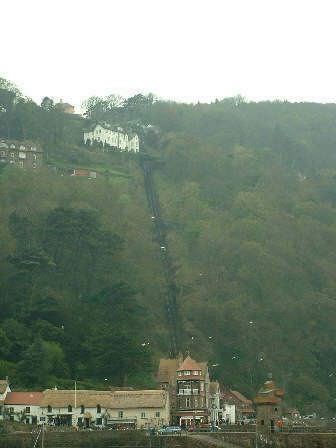 This view of it gives an idea of how steep the climb is, the road takes a longer way round, but still includes hairpin bends. 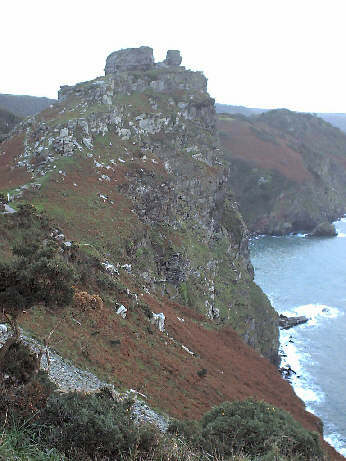 Near to Lynton is the Valley of the Rocks, where the moor ends dramatically in the sea. 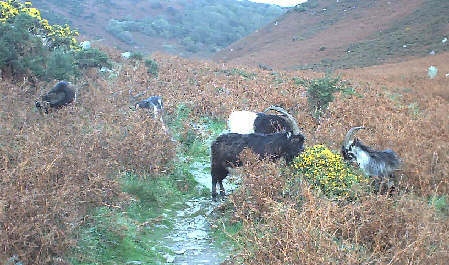 A feature of the Valley is the herd of wild goats, which are an endangered species, and, as far as I know, are the only wild goats in England. 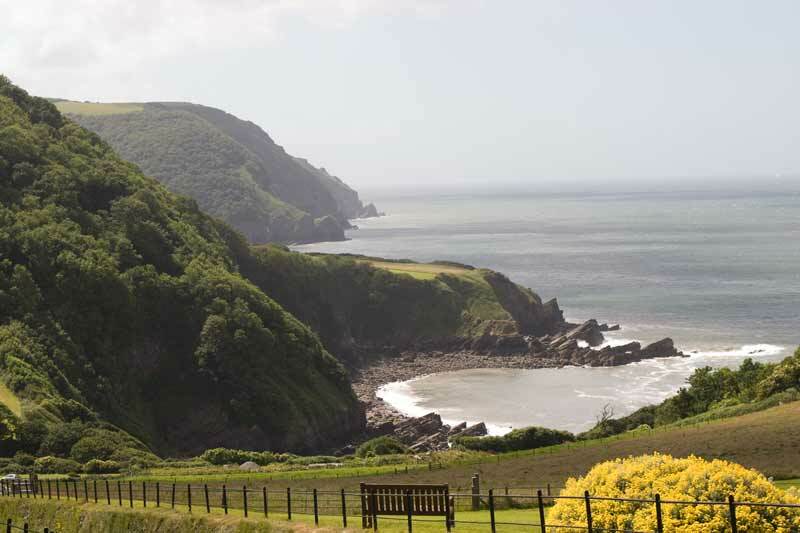 The view from the sign however is marvellous, looking down to Woody Bay. 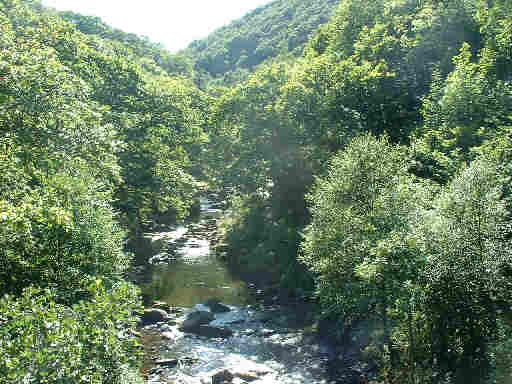 Near Lynmouth is Watersmeet where the East Lyn River and Farley Water meet. 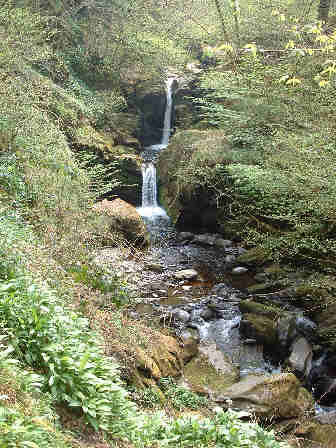 Farley Water tumbles down a series of waterfalls as it nears Watersmeet. 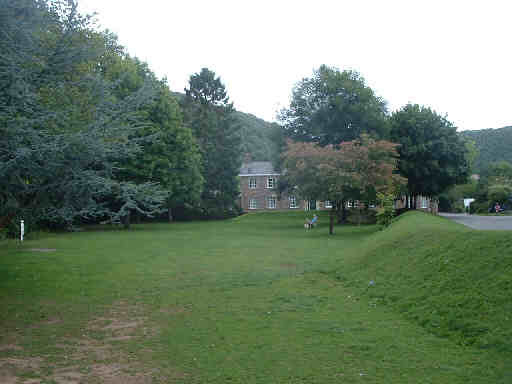 The East Lyn makes a larger but less spectacular entrance. 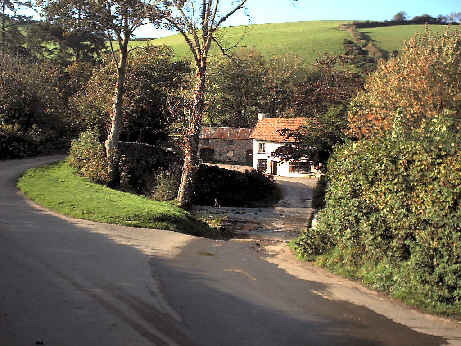 The East Lyn flows on towards its junction with the West Lyn and the sea. 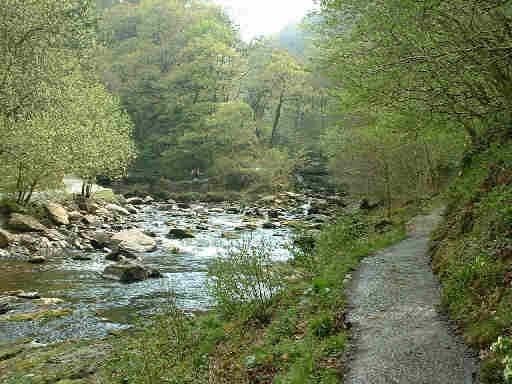 Watersmeet itself where the two waters come together. 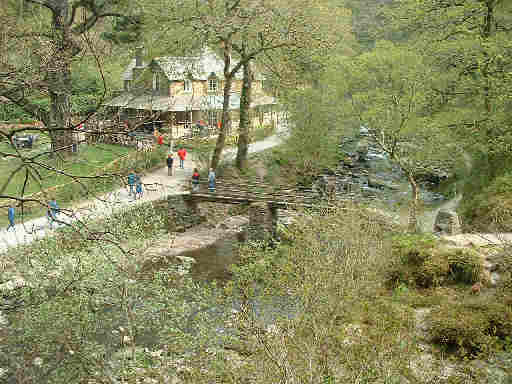 Looking down on Watersmeet from the path leading down from the main road, the building is now a café operated by the National Trust who own the area. 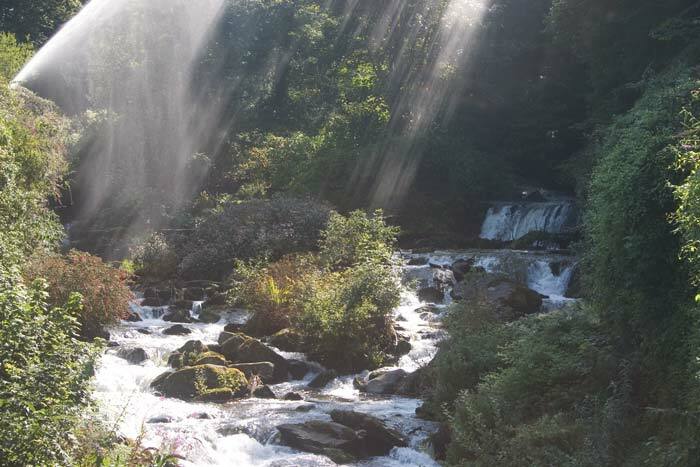 A last view of Watersmeet, Farley Water falls down to meet the East Lyn. 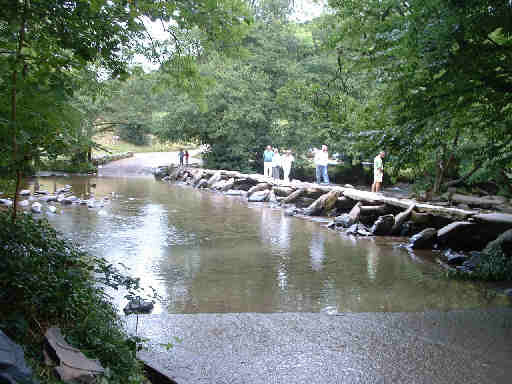 Near the centre of Exmoor is Tarr Steps, an ancient clapper bridge alongside a ford over the River Barle. 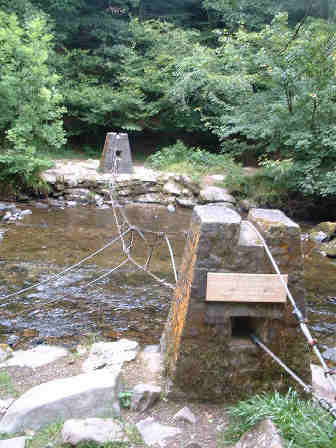 Upstream over the clapper bridge is this construction, not a modern bridge but a tree catcher to stop trees being washed down by floods damaging the old bridge. 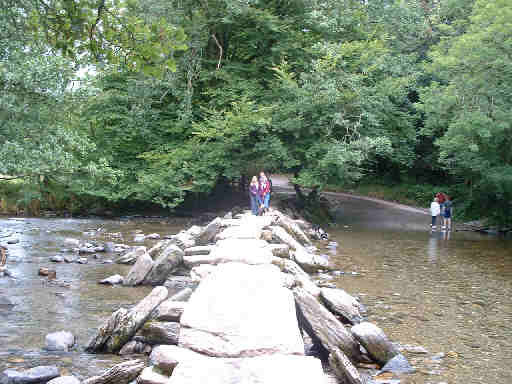 Another bridge further down the Barle at Dulverton, not far from where the Barle meets the Exe. 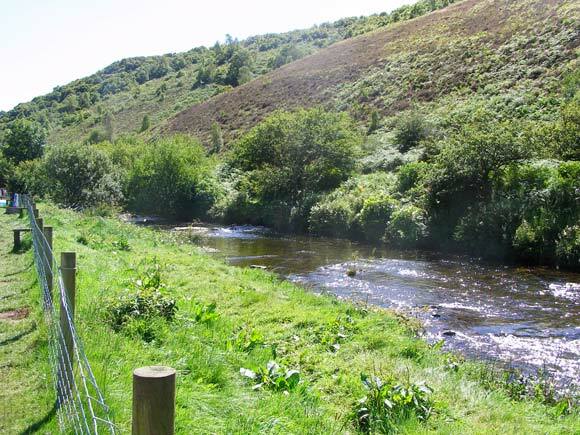 Looking the other way, a picnic area by the river and the headquarters of the Exmoor National Park. 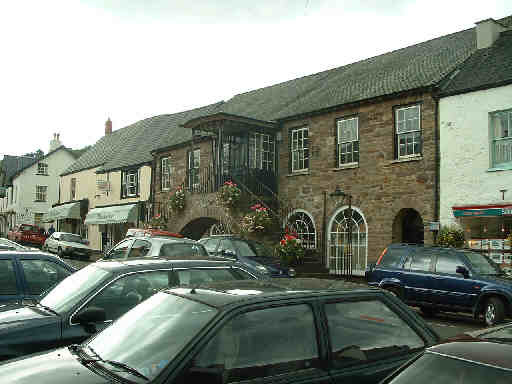 Dulverton's Town Hall has these unusual arched steps outside. 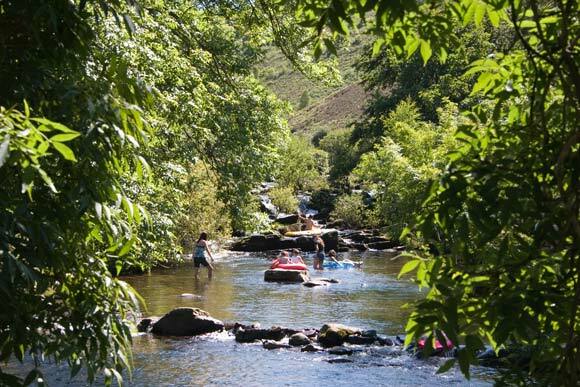 Dulverton is right on the southern edge of Exmoor. 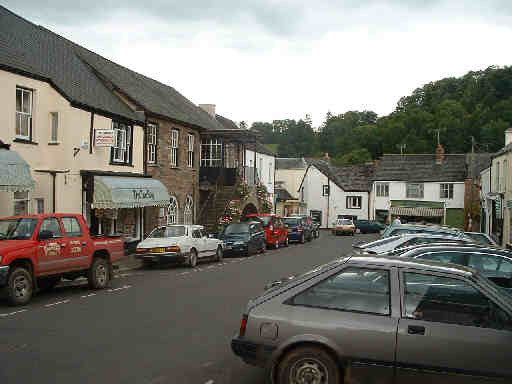 A last view of Dulverton town centre with the wooded hills across the river in the background. 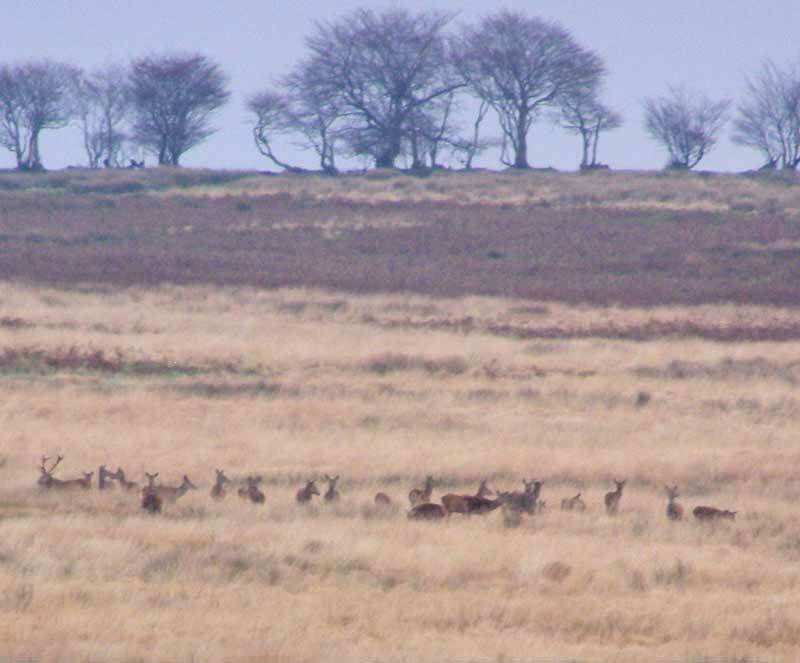 Deer are very much part of Exmoor but seeing them can be hard. 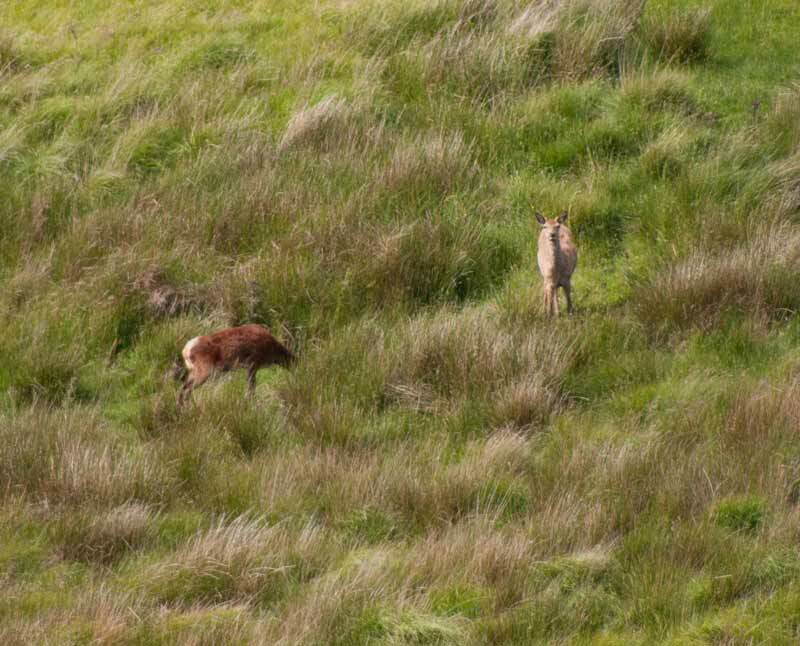 Here's four pics of some red deer near Dulverton. 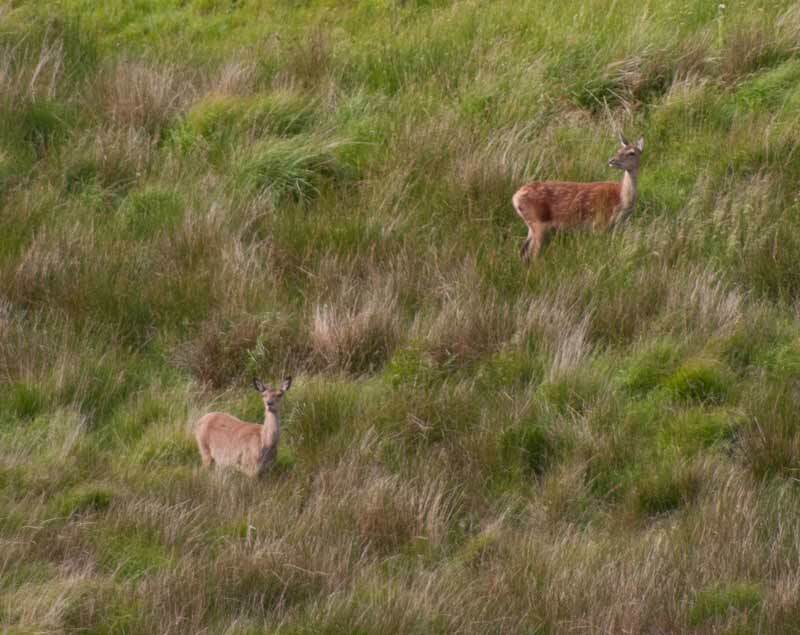 These were taken from the roadside across a valley even so they were aware of us but not so concerned as to run. 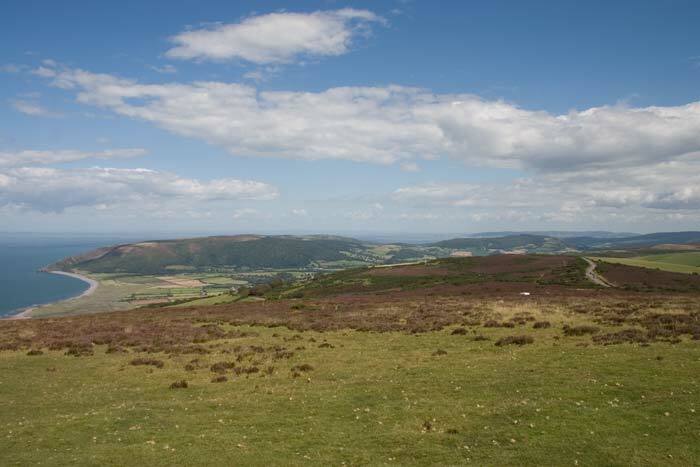 A view from above Elworthy looking towards the Bristol Channel, on a good day you can see across to Wales - but so far not when I've had a camera with me. 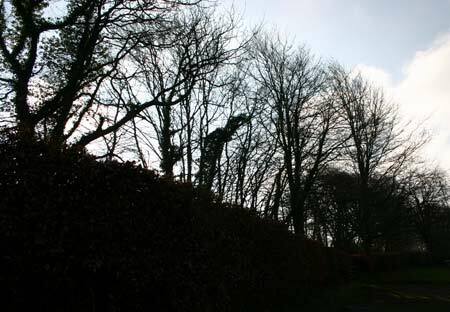 Bare trees in winter silhouetted against the January sun. 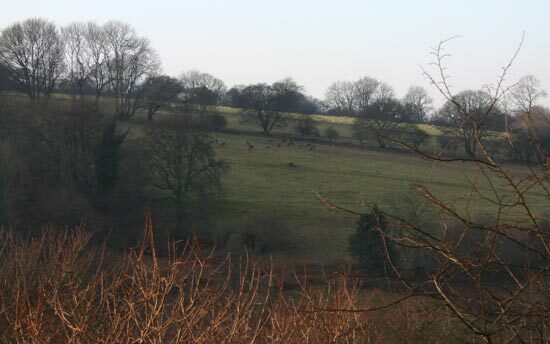 Also above Elworthy you can often see deer on the hillside, must get a better lens for photos like this! 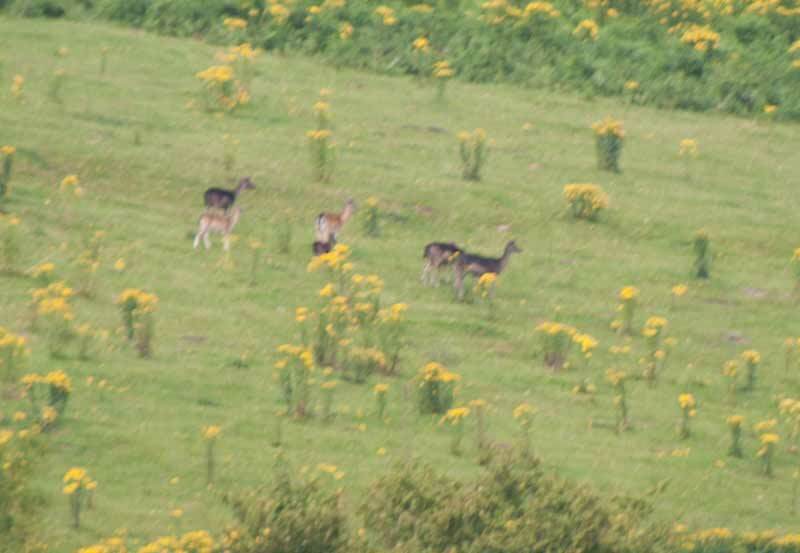 With a better lens I got this one of some red deer in a field with an real ragwort problem. 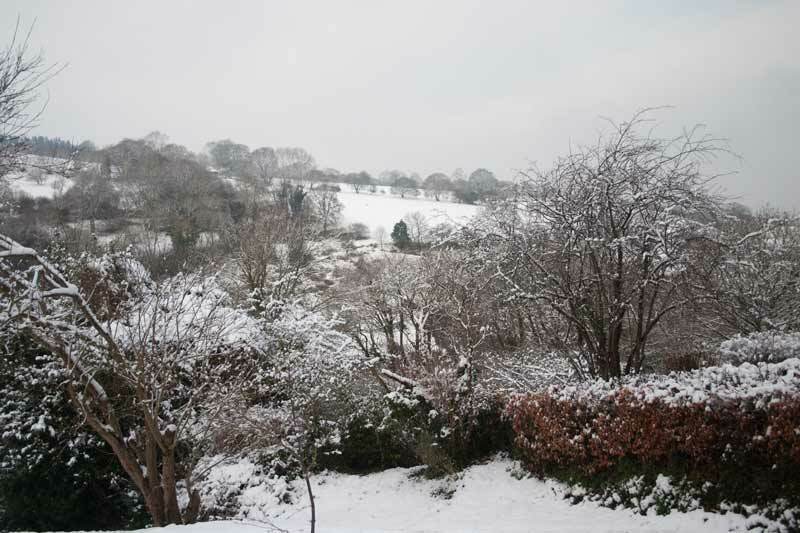 A winter view including the same field with plenty of snow around. 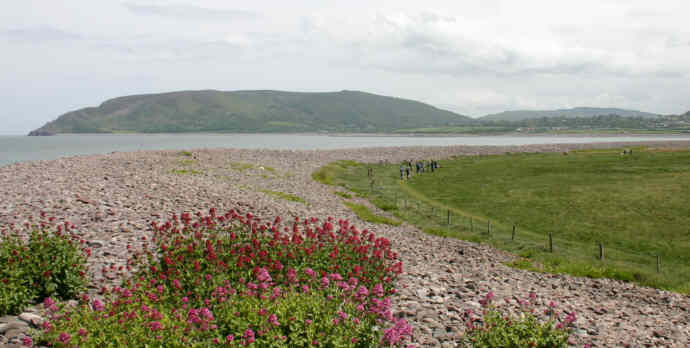 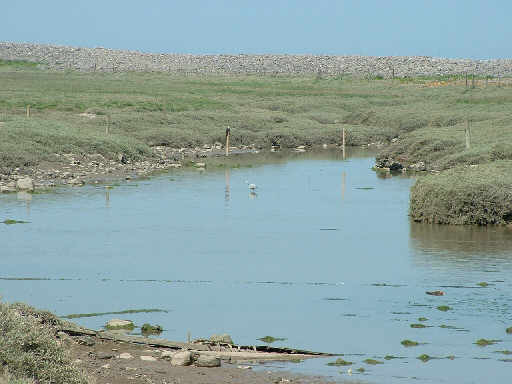 Back to the coast, Porlock Weir is at the end of a shingle bank which protects an area seaward of Porlock itself, rather than a weir there is in fact a small dock. 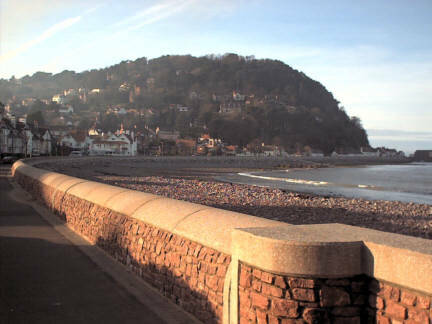 Looking along Porlock Beach towards Selworthy Beacon, which is in effect the western end of Minehead's North Hill. 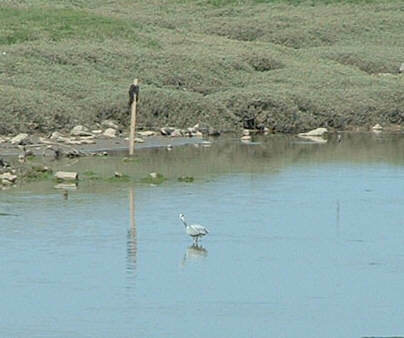 At the far end of the dock is a small area of water held back even when the tide is out, on this occasion a heron was hunting for lunch. 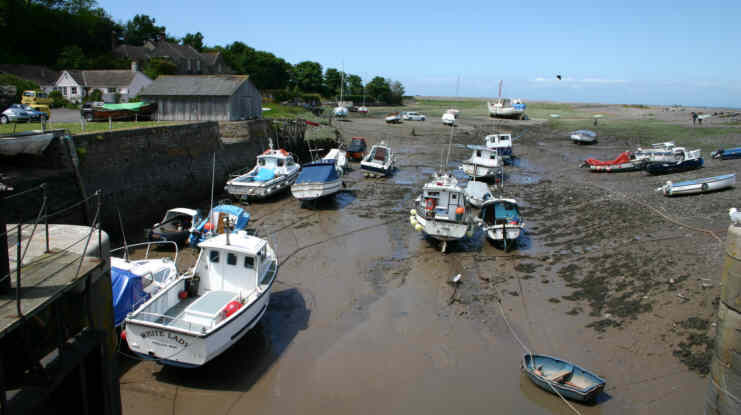 Looking towards the disused dock gates, this part dries out at low tide leaving these boats aground. 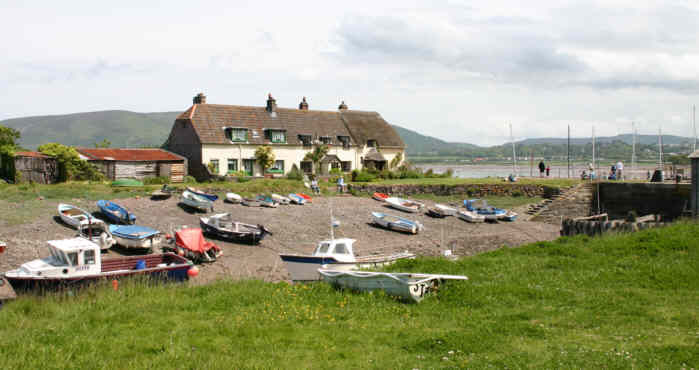 Another view of the harbour with some "chocolate box" cottages the other side. 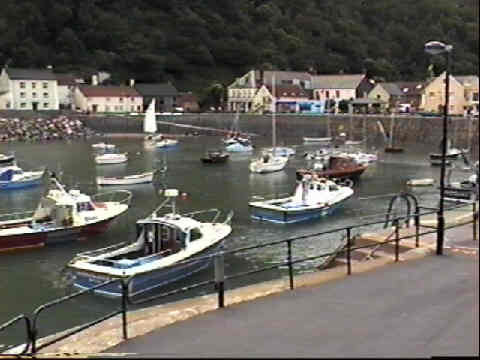 Looking down on the boats from the footbridge over the entrance. 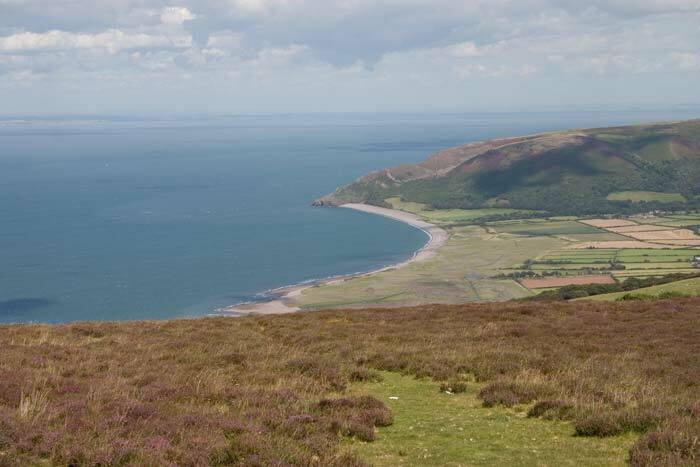 Porlock Weir again, this time seen from on top of Selworthy Beacon, the white dot in the sea is the MV Balmoral on her way from Minehead. 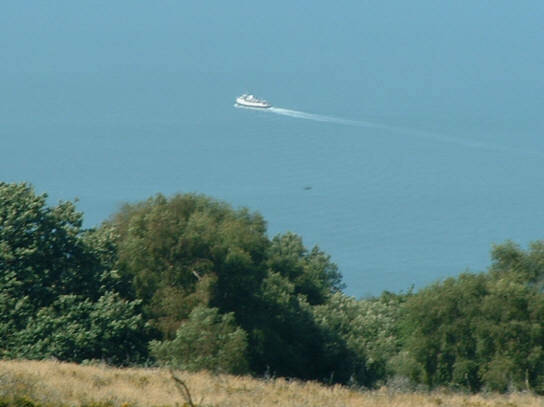 A zoomed in view of the Balmoral, she had just called at Minehead on one of her cruises in the Bristol Channel. 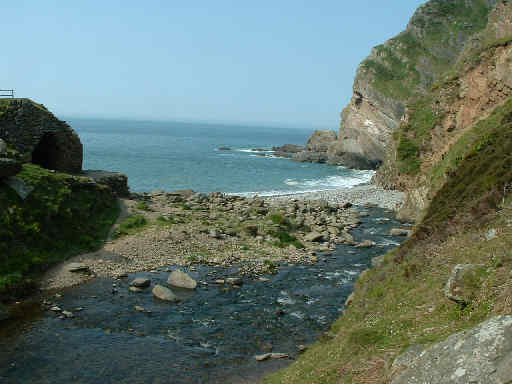 She is operated by the same people as the paddle steamer Waverley which also visits this coast. 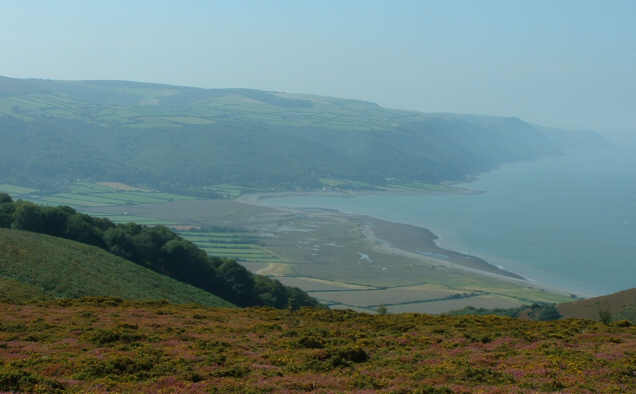 A final view of Porlock Weir from slightly further across Selworthy Beacon, the area of marsh visible here is in great danger of being lost to the sea due to climate change. 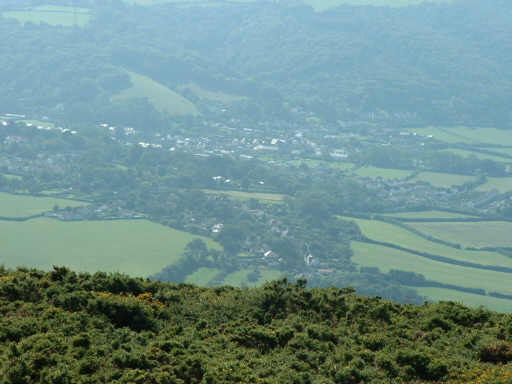 Now one of Porlock village, again seen from on top of Selworthy Beacon. 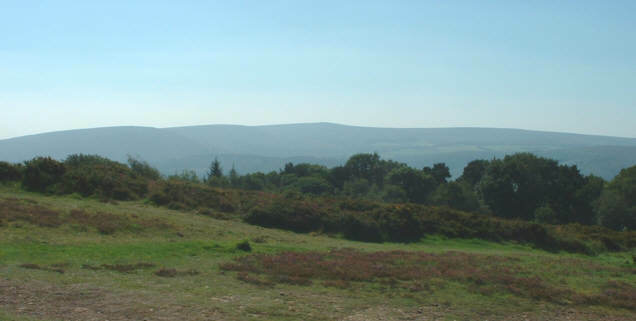 Turning to look south Dunkery Beacon, the highest point on Exmoor, is in the centre of this view. 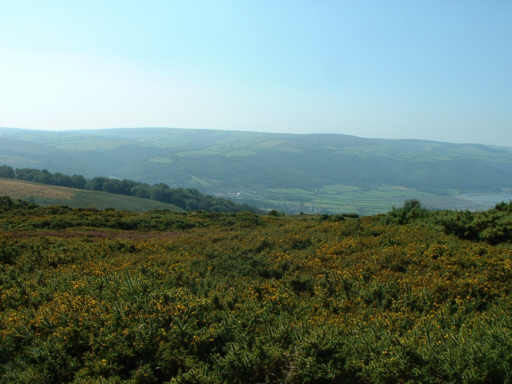 The heather and gorse on Selworthy Beacon, a mix of yellow and purple. 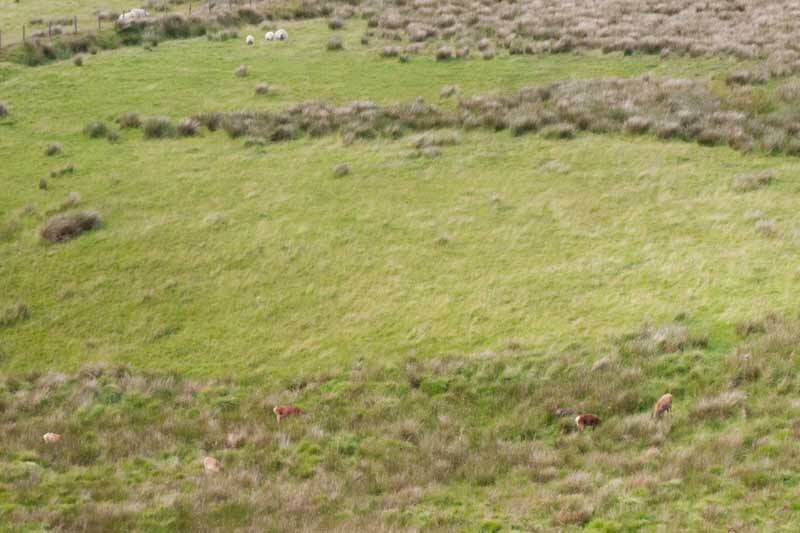 This patch has regrown after a fire, a fairly common occurrence on this section of the moor. 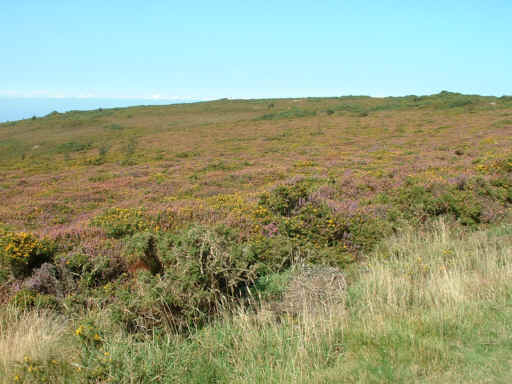 Another view of the gorse and heather. 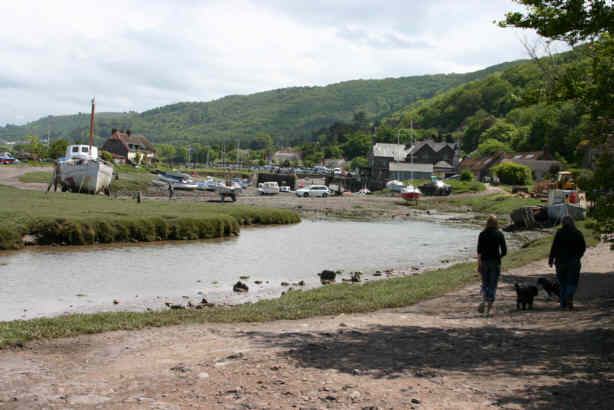 Two views from the other side of Porlock looking across Porlock Weir to Selworthy Beacon. 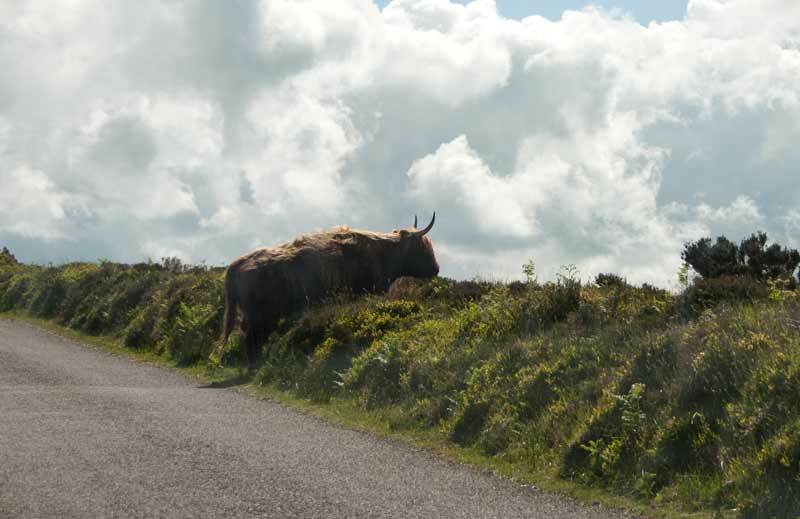 Many roads on Exmoor are unfenced hence our coming across this Highland Cow crossing the road near Dunkery Beacon. 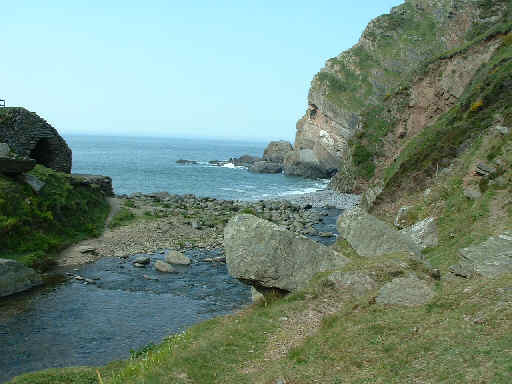 Moving almost to the opposite end of Exmoor, Heddon's Mouth is part of a National Trust property centred around Hunter's Inn. 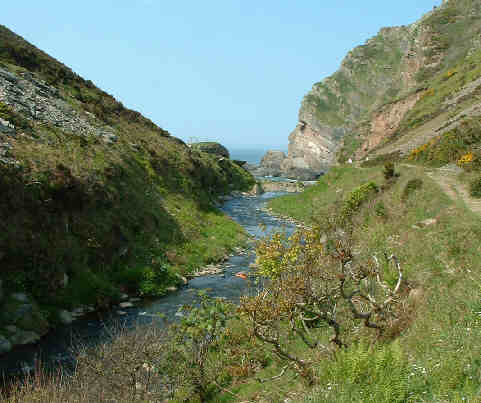 The Heddon stream is seen here nearly down to the sea. 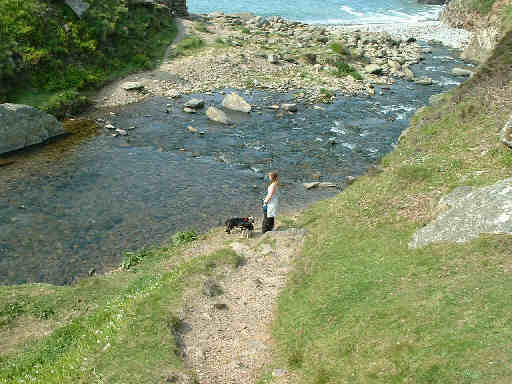 Closer to the sea and the point where the stream runs over the shingle to the ocean. 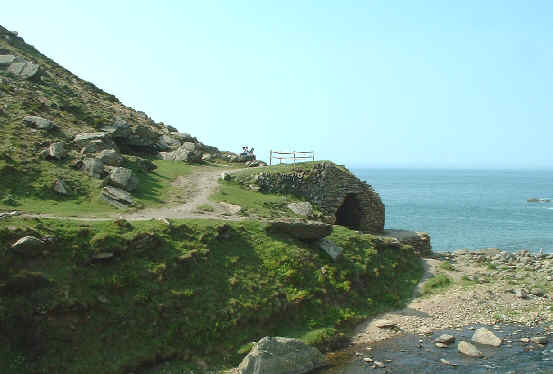 I think I went down the wrong side of the stream, this looks to be a good vantage point over the sea and the beach to the west of the mouth. 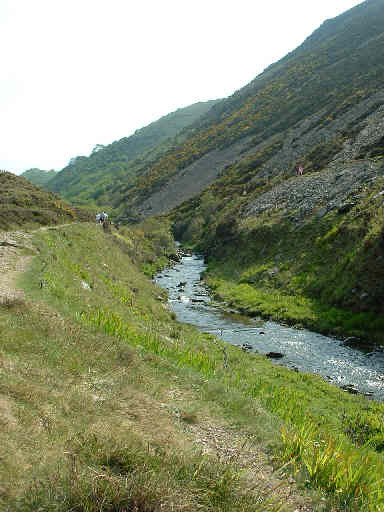 Looking back up the stream, a steep sided valley with a lot a scree on the steepest slopes. 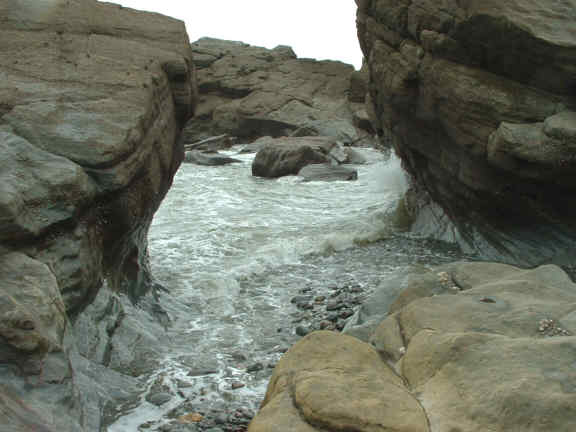 The stream meets the beach and thence the sea. 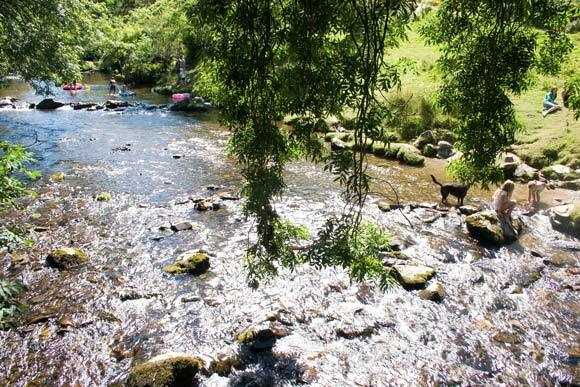 A place to cool off on a hot day - dare we jump in? 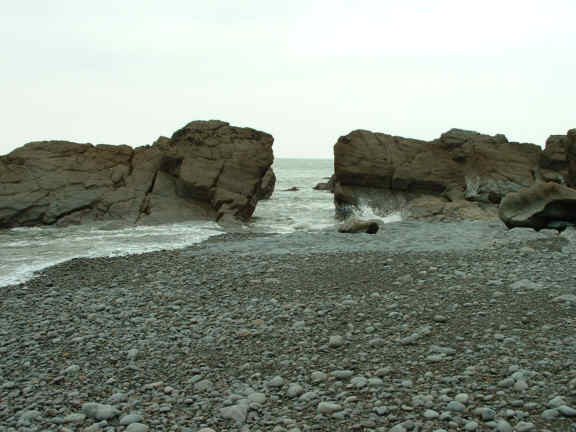 Down on the beach looking west on a cooler, duller day. 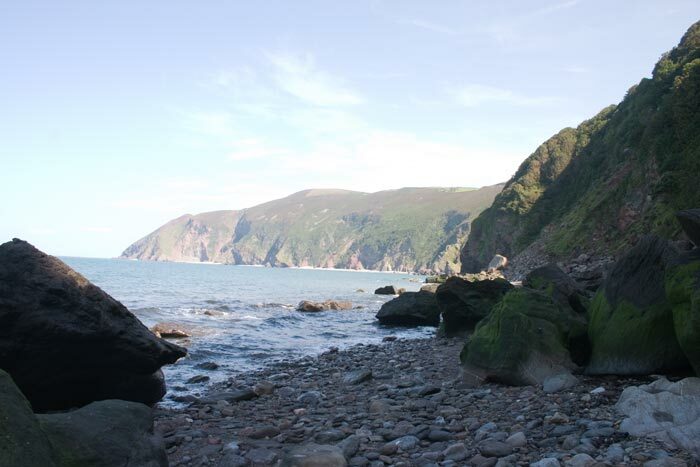 Exmoor does finish rather abruptly where it meets the sea. 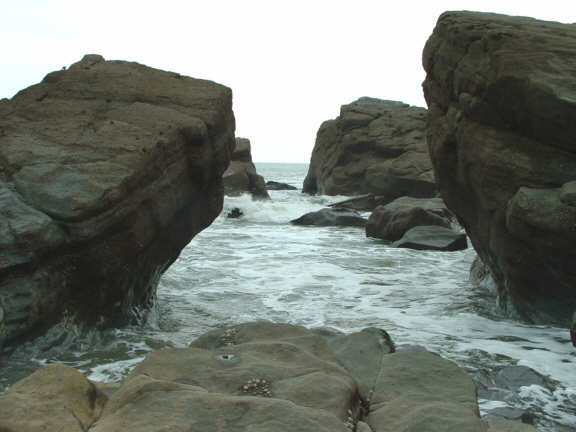 On the east side the beach is bordered by rocks which the sea surges between. 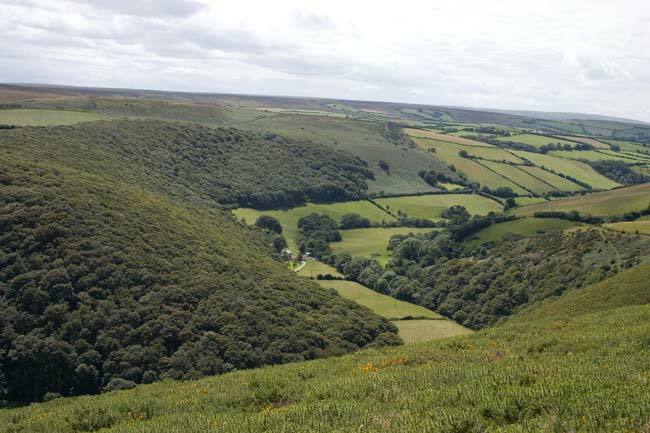 Aspects Of Exmoor has more views of Exmoor.